Feedly has rolled out an unannounced update this week for its news reader app. The update is so new that you won't find the update in Google Play or mentioned on the Feedly blog, but Android Police found it. The update (here) adds support for Google Now as well as better auto-complete in the search function and Power Search. That last is only available to paid users, and the Google Now integration will need Android 4.1 and above. For those not following the nitty-gritty details on Google services, Google Now is Google's intelligent virtual assistant. It's designed to show you exactly the information you need when you need it, which IMO makes it a rather odd feature to add to a news reader app. Along with The Guardian, ABC News, Wattpad, Economic Times, and other news apps, Feedly is one of over 100 apps that support Google Now. 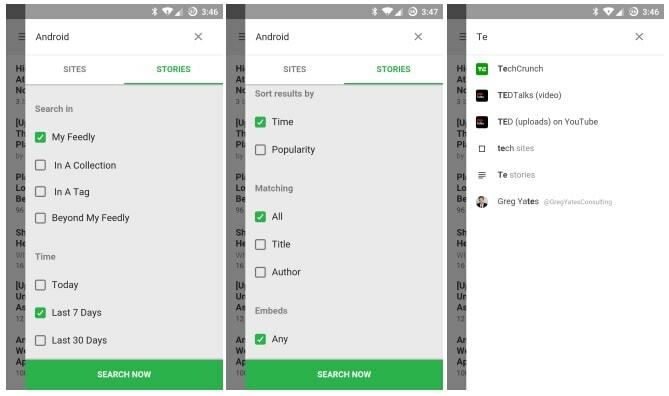 Feedly was one of the 70 plus added to the program last week, and another 30 or so apps were added when the Google Now API was released in January. Adding Google Now into Feedly could certainly be useful for users who want to quickly digest bits of news every morning without having to directly open a third-party app. I, for one, would rather open the app and be inundated by a flood of news and not a trickle. The update appears to be rolling out slowly, but if you don't want to wait you can download a copy of the APK and install it yourself. The feedly Pro power search is now available on mobile. Google Now integration. The most engaging story in your feedly gets pushed to Google Now every morning at 7:00am. Is the Kindle App Draining the Battery on Your iPad/iPhone?